I’ve been shooting now for about 25 years, and in that time I’ve used a lot of different equipment and what I use today is an evolution of needs and compromises. I have to admit, I am an equipment junkie. I have lots of cameras that don’t even have a practical use anymore, but I keep them for sentimental reasons or that I consider them to be collector items. Most are old film cameras and a lot of those don’t even have available film sizes anymore. I think it says something that while digital cameras can be considered “out of date” within a year after their release, most of these old film cameras actually outlasted their medium. I’ve been shooting 100% digital for several years now, not because I don’t like film, but because the practicality of shooting, processing, and scanning film is far outweighed by the endgame of producing lots of images. A good, modern digital camera with a good quality lens has the ability to compete with a 4X5 film image, yet has the portability of 35mm. I think its also important to point out the fact that it really isn't about the equipment. I’ve shot with everything from a 4X5 to a cell phone and what really matters is being in the right place at the right time and knowing how to use the tools in hand to capture the moment. I’m not going to say that a cell phone is a great camera, but they are a lightweight option with reasonable quality. When something is lightweight, you have more of a tendency to actually bring it with you, and when a moment happens, you at least have an opportunity to capture it. I don’t have a lot of money to spend on equipment, so when I do buy something, its usually because I’ve done lots of research about what I think its worth to me in the long run. I like things that are built well and have good quality, but I’m also looking for value. Lenses keep their value. They are still a good investment. Digital cameras, however, are a horrible investment. Its like a new car that depreciates as soon as you drive it off the lot. Not only do the changes in technologies immediately outdate them, but electronics are thought of as “disposable” in our society. Why buy a used 6 megapixel digital camera with dust on the sensor when for just a little more you can get a brand new one with 18 megapixels? I think of digital cameras as “film cost”. They have taken the place of what you would have paid for several years of film and processing. As for accessories, I use a Canon Speedlite 430EX II, a Kenko Extension tube set, and occasionally Tiffen or Hoya filters. I still carry most stuff in my old Tamrac 787 photo backpack. For lighter trips I use a LowePro Slingshot 202 AW. Lighter still is a LowePro Orion fannypack. I’m looking to update my tripod soon, but for now it is still my trusty Bogen (Manfrotto) 3021 legs with a Bogen 3038 ball head. I switch to a 3047 pan-tilt head for more precise framing. Canon EOS-1N film camera, Canon EOS Rebel XTi, Canon EF-S 18-55mm, Canon Powershot S5 IS, Canon S100 Digital Elph. Toyo 45AX 4X5 film camera used with Caltar/Rodenstock 150mm f/6.8 and Schnider 65mm f/8 lenses. Fuji Quickload 4X5 film back. 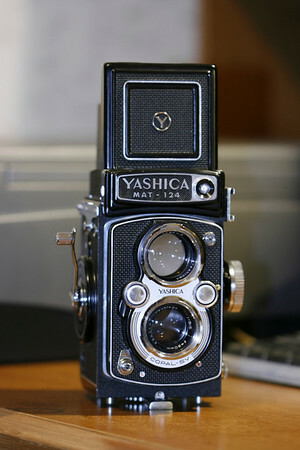 Sometimes used with a Wista 6X9cm 120 roll film back for film economy and crop factor.